A 17-year-old student activist from Whidbey Island, Wash., who energized more than 2,000 pro-Second Amendment demonstrators earlier this year at the state capitol in Olympia, is reportedly calling for a student walkout to protest passage of a gun control initiative that strips young adults of their right to purchase and possess any semiautomatic rifle beginning Jan. 1, according to MyNorthwest.com. Aryeh Rohde would have been old enough to buy a self-loading rifle next year, but the passage of Initiative 1639 put the brakes on any such plan. Under this new law, young adults ages 18-20 can no longer legally buy even a .22-caliber semi-auto such as the popular Ruger 10/22, which is among the most commonly-owned small game hunting and recreational target rifles on the landscape. The measure, supported by the billionaire-backed Alliance for Gun Responsibility, was passed by voters Nov. 6. But Rohde is apparently borrowing a page out of the gun control student playbook from last March, when student activists from Parkland, Florida inspired a walkout of high school students around the country to protest school shootings and demand more gun control. If Rohde’s walkout materializes, it will not be the first show of defiance in the face of the new law. For example, the police chief in Republic, Ferry County, has reportedly declared he will not enforce the statute after it takes effect next year. 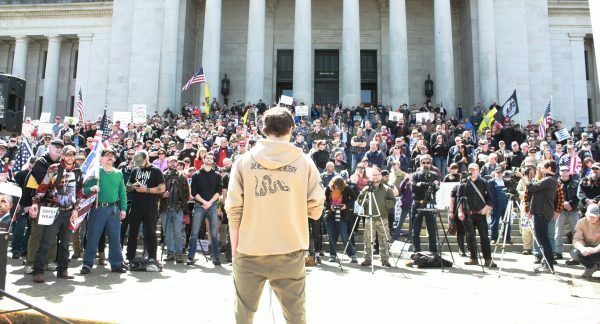 Law enforcement organizations representing thousands of rank-and-file police and sheriffs’ deputies uniformly opposed I-1639, and many argued that its provisions on so-called “secure storage” are unenforceable or unconstitutional. For his part, according to the published report, Rohde is working as part of a Libertarian group on Whidbey Island. When he spoke at the spring demonstration, he told TheGunMag.com that he had been silenced by his high school principal for expressing pro-Second Amendment beliefs during the campus walkout that was part of the nationwide anti-gun protest. The 30-page initiative requires so-called “enhanced background checks,” a 10-day waiting period on the purchase of a semi-auto rifle, annual background checks, registration, a training requirement within the previous five years, “secure storage” and it creates the new crime of “community endangerment” under which a gun owner may be prosecuted if his/her gun falls into the hands of an unauthorized person who then harms someone or commits a crime. Opponents argued that this makes criminals out of crime victims. Washington gun owners are anticipating legal actions to challenge the initiative in court.